« Cold Weather Health Tip-Avoid Hypothermia! In the past few weeks a few of my friends have lost loved ones to cancer and heart disease. Loss is never easy and grief take s a lot out of us emotionally and energywise. Losing a life partner, a parent or anyone close to us is like having major surgery ourselves. The funeral and wake may come and go quickly, but the grieving process takes much longer. And the stress of carrying on daily life while grieving can be stressful. 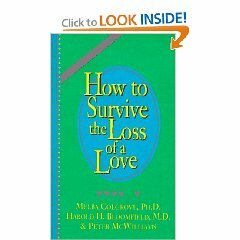 The book is called “How to Survive The Loss Of A Love,” by Peter McWilliams, Harold H. Bloomfield and Melba Colgrove. Reading one book won’t eliminate all grief and pain, but this book is easy to read, full of helpful tips to help you work through the grieving process and it’s only about $8.00 on Amazon. I hope it helps you as much as it’s helped me and others I know!